At last week’s Enterprise Connect Conference, Tamara was the #1 Social Influencer by a wide margin according to data from iTrend Analytics, performing with major brands such as Verizon Enterprise, Skype, Cisco, Polycom and Avaya. Interactions are calculated through a combination of Twitter retweets and replies in conversations which demonstrates actual, active engagement with other individuals and organizations on Social Media. Enterprise Connect is a 4 day conference held every year at the Gaylord Palms Resort in Orlando, Florida where the latest systems, software, services and applications for enterprise communications and collaboration are discussed. Over 6,000 people and over 180 exhibitors attend the annual conference. 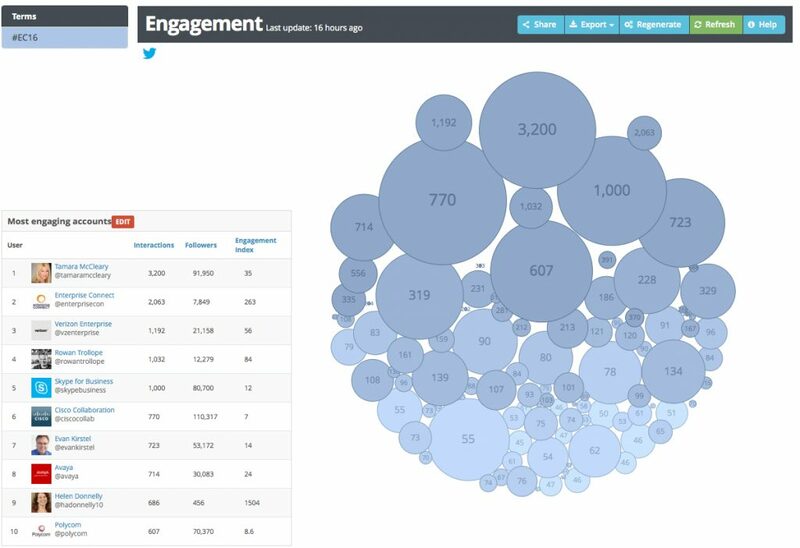 You can view an overview of the social media engagement at Enterprise Connect, with a scrollable Top 100, by iTrend Analytics by clicking here.